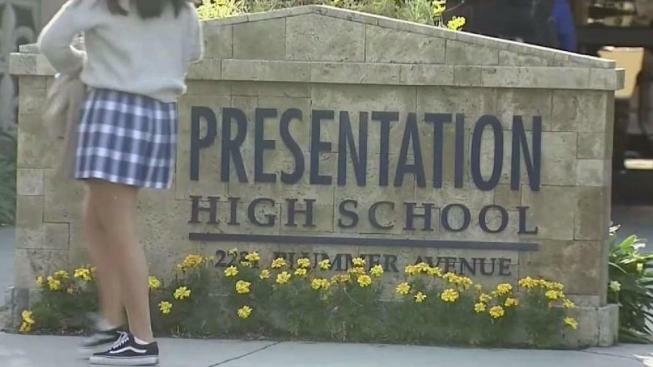 San Jose police say they’re investigating whether officials at Presentation High School violated mandatory child abuse reporting laws in connection with recent allegations of sexual misconduct at the prestigious Catholic school for girls. News of the investigation comes just one day after the school responded to numerous sexual misconduct and harassment allegations by creating a new independent office for addressing such incidents and a committee in charge of preventing future misconduct and abuse. A spokesman for Presentation High School said the school welcomes the investigation. Former Presentation High students advocating for sweeping changes at the school have been pushing for this type of investigation since last fall and say they’re not satisfied by the administration’s most recent efforts to address allegations of sexual misconduct that span nearly three decades. "Because Presentation High School never involved the police when they were supposed to, further victims were abused and assaulted," said alum Kathryn Leehane, whose newspaper oped touched off the Make Pres Safe movement. Police declined to release additional details on the investigation, so it’s unclear which allegation is the focus of the probe. Twenty former Presentation students have come forward so far, some anonymously, with allegations of sexual assault, sexual harassment, inappropriate touching and other forms of sexual misconduct. At least eight former teachers have been accused of some form of sexual misconduct, some dating back nearly 30 years, some as recent as last year. Leehane was critical of the schools decision to create a new office to investigate accusations of sexual misconduct, saying it can’t be truly independent while current Principal Mary Miller and former Principal Marian Stuckey, both accused by multiple former students of violating child abuse reporting laws, continue to serve on the board. The school's actions come following an NBC Bay Area investigation that revealed multiple sexual abuse allegations against a former teacher at the private San Jose high school, as well as complaints about sexual harassment and abuse involving other faculty and staff. The new independent Office for the Prevention of Student Bullying, Harassment and Abuse will report directly to the all-girls school's board of directors and will complement the four existing school counselors, school officials said in a release Tuesday sent out by Singer. “As a school dedicated to the empowerment of women and committed to social justice as a core part of our mission, the accusations from past alums are not reflective of who we are," Miller said in a statement. "We cannot erase the feelings or change the perceptions of some. But we can learn from the opinions expressed and move forward with even greater resolve. I am deeply sorry that any alum has ever felt unsafe as a result of any action by our faculty or administration." Leehane, who strongly condemned any hateful messages sent to the school, said school administrators must acknowledge past mistakes and be held accountable for their actions.